Notre Dame Cathedral full of young pilgrims. One of the members of the Grand Priory of Great Britain undertook the Chartres Pilgrimage. He gives the following account of it. Further photos at: Notre Dame de Cretiente. Jubilant, and blister free, I have just returned from the annual three day pilgrimage from Notre-Dame de Paris to Notre-Dame de Chartres, organised by The Association of Our Lady of Christendom. The theme for the pilgrimage this year was “Jesus Christ Saviour of the World” and each day through Mass, spiritual exercises, confession and praying the Rosary we felt a real sense of hope for the Church! Drawing together thousands of people, from places as far away as the Middle East, in a very simple way we saw our rich Catholic tradition manifest on the Parisian streets and in the French countryside. For the second time in three years I was a part of an overtly faithful youthful, dynamic and challenging witness to the universality of Catholicism. This year the schedule had to be changed because of the limited space on the ferry, instead of meeting at Westminster Cathedral for Mass, we met St Pancras to take the Eurostar directly to Paris. At the station I was immediately stuck with the sense of familiarity and friendship among the group. Suddenly I, in reality a mere novice, had become a seasoned veteran able to answer the many questions of those who were about to embark on their first experience of Chartres. Sharing the carriage with other travellers, we had to forgo the usual housekeeping introductions. 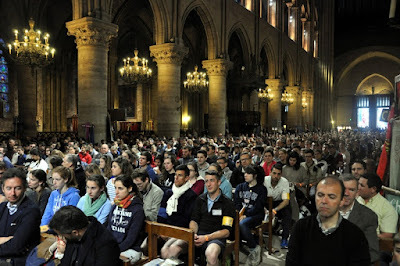 Nevertheless we did have the chance to come together on the short journey to Paris and, over those 2 hours, we spoke about why we were joining the pilgrimage. On arriving in to Gare du Nord we made the short trip to our hotel and each person went their separate way to make preparations for the next day; for me this included dinner and stocking up on essential supplies for the trip. The pilgrimage started on Saturday morning as we arrived outside Notre Dame Cathedral and loaded our bags onto the Etrangers van to be transported along the journey. Each year on the first day there is always the tangible feeling that we are all about to embark on an arduous journey, one together in faith. The three day pilgrimage is incredibly liberating, it provides everyone with the opportunity for silent contemplation and like it or not a chance to escape everyday distractions of a mobile, watch, work etc. The pilgrimage organisers prepared mediations for the priests to lead throughout the walk. Each one was inspiring in content and uplifting in message; covering faith, tradition, history and modern day events. I personally benefitted from these 20 minute periods of contemplation and personal prayer, which were a good relief to the usual noise and hustle and bustle of my daily life in London. It was with great enthusiasm that we entered and took our allotted place at the front the Cathedral with the Normandy region. This year we were around 50 pilgrims, making up the two British chapters; walking under the banners of Our Lady of Walsingham and Saint Alban. What more of an inspiring way to start off a pilgrimage could we have had that to participate, in a packed Notre-Dame, in a Solemn Mass celebrated by Dom Louis-Marie OSB, Abbot of Sainte-Madeleine du Barroux, in the presence of The Right Reverend Jérôme Beau, Auxiliary Bishop of Paris; both of whom peached superbly and directed us to continue in prayer and to be proud of our faith. After the blessing of the banners the pilgrimage started in earnest. Walking through the streets of Paris I reflected on what impact the throng of Catholics, banners unfurled, would have on the ordinary lives of those who live and work in this major European city. On a practical note, the support team worked with such organised precision that each chapter was protected, guided, assisted and when needed encouraged to make the next stage of the journey. We walked at a brisk pace and on leaving the built-up city we arrived into rural France, where at the first stop we were welcomed by fresh water and the most refreshing apple that I can remember! Throughout the rest of the day we were blessed by superb weather, and after 12 hours of walking the group had come together as a unit working with and for each other. Walking into the first campsite we were lucky that our bags and tents were situated at the entrance. The relief on peoples’ faces was obvious and after a brief moment of calm, the pilgrims went about their own routines of unpacking, cleaning and eating, before bedding down for the night in preparation for the next days’ early start. Bishop Schneider offered the most inspiring and heartfelt sermon for the Mass, himself being a fellow pilgrim, and he pulled no punches in what he had to say. He spoke directly to those gathered in that field, but his words were directed well beyond this captivated congregation. The most salient part for me was his closing exhortation: “What a beautiful vocation it is to be a true Catholic! What a beautiful vocation to fight for the integrity of the Faith, and the commandments of God! What a beautiful vocation it is to be a Catholic family, a domestic Church! What a beautiful vocation it is to be a chaste young man, or a chaste young woman! What a beautiful vocation it is to be a seminarian and a priest with a pure and ardent heart!” Following the Mass we set off for the final stages of Sunday’s march. As we continued into the afternoon and early evening, just as it had been on the first day, the group was feeling strong and elated by the day’s events. We were all given a life as we saw, with 2 hours left to walk for the day, the spires of Chartres Cathedral in the distance. Arriving at the campsite that evening we were all feeling in high spirits and, after a day of beautiful weather, welcomed the coolness of the evening. Having completed the usual ritual of washing and eating, I headed up to the transportable Altar at the center of the campsite to attend exposition and benediction – which was presided over by The Right Reverend Michel Pansard, Bishop of Chartres. It was a beautiful way to round off the day in quiet adoration, and the Bishop spoke about the need to consecrate our lives to the Blessed Virgin Mary; every step on our pilgrimage being a prayer to the Mediatrix of all graces. During the final day of the walk I was conflicted between the feeling of relief and joy that the end was in sight, and the feeling of sadness that the experience seemed all too short! The chapter had become on community of friends, who had been on a journey together and who would, no doubt, share these experiences going forward. The last day is much shorter than the others, but it does still involve over 5 hours of walking! They were, for me, the best 5 hours. We sang out in loud voice Jubilate Deo! as we approached Chartres Cathedral, unlike in 2013 the bells were silent, but for that fact we sang out even louder. During the Mass, offered by The Very Reverend Emmanuel-Marie, Abbot of Sainte-Marie de Lagrasse. It is hard to describe the feeling of being surrounded by thousands of people who have all just completed such an arduous walk, yet are elated and singing out in joy at arriving in front of the Cathedral. As the procession of the statues of Our Lady, the banners, the Priests and Religious and Sacred Ministers passed through the streets the pilgrims were on their feet singing and applauding – nous avons arrive! The Mass was the perfect end to the day, before we all wound our way to the comforts of the local hotel. On Tuesday morning we had Mass together in the crypt of the Cathedral, where Fr Bede Rowe gave a perfectly pitched sermon which resonated very personally and spiritually with our group; to him I can only say thank you for summing up in a few short sentences the depth of feeling I had experienced. A special thanks has to be given to 2 other priests who accompanying us on our journey, Fr Joseph Gedeon and Fr Alexander Redman. Both gave strong spiritual direction to those who requested it, and heard countless confessions as we walked. I would strongly encourage anyone who is interested in learning more about themselves and their faith, familiar with the extraordinary form or not, indeed Catholic or not, to consider making this pilgrimage next year! It has become an important part of my year, and I have made some strong friends through this journey. Regina sacratissimi Rosarii – Ora pro nobis!